The Third International Platinum Conference follows on from the first two such events held two years apart. Global demand for platinum rose by 1.2 per cent to 6.78 million ounces in 2006, supported by an increase in the use of this metal for autocatalysts and a range of industrial applications. This growth more than offset a decline in new metal purchased by the jewellery sector. Supplies of platinum also climbed in 2006, rising at a slightly faster rate than demand, to reach a total of 6.79 million ounces. South African production expanded to 5.29 million ounces, boosted by new mines at Everest and Two Rivers on the Eastern Limb of the Bushveld, and strong performances from established producers. In 2005, the mining of platinum group metals in South Africa generated a revenue of R38.5 billion, or 27% of the total from primary minerals. The industry also employed 35% of the mining workforce in South Africa. In recent years, the platinum mining industry has seen substantial transformation with the introduction of more mining companies, including a number of new enterprises, and the takeover of some of the smaller companies; bigger and better BEE deals, and the award of New Order Mining Rights; the strong emphasis placed on safety in the workplace; extensive exploration programmes and associated feasibility studies; improved metallurgical recoveries; the adoption of environmentally sound operating practices; and, last but not least, a massive increase in mechanised mining. The purpose of this conference is to share these advances with all those determined to make the mining and production of PGMs a safer and more profitable activity. The slogan 'Platinum in Transformation' was selected to describe the changing nature of all aspects of platinum mining, beneficiation, and marketing. 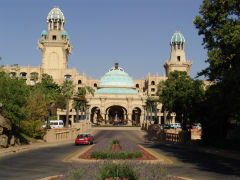 The conference is planned to begin on 5 October 2008, to allow for some introductory social activities (on the Sun City golf course, for example) on the Sunday preceding the three-day conference. Post-conference plant visits will be arranged for those interested on Thurday 9 October. Of significance to South African participants who are registered professional engineers, is the fact that this conference will provide points towards the Continuing Professional Development that is required (as of 1 January 2006) to maintain registration with the Engineering Council of South Africa. Please include my details on the mailing list for Platinum 2008.